Dee Gallo, president of Archivists for Congregations of Women Religious (ACWR), announced election results on Tuesday, March 27 for the organization of approximately 350 members. Elected to Vice President / President-elect is Lisa Gibbon, Director of Congregational Archives for the Congregation of St. Joseph in Cleveland, Ohio. Elected to the position of Secretary is Mary Navarre, OP, Director of the Archives for the Dominican Sisters in Grand Rapids, Michigan. Both Lisa and Sister Mary will be officially installed at the group’s Triennial meeting in Louisville, set for September 13-15. “We appreciate your prayers for a successful and productive meeting,” said Dee. 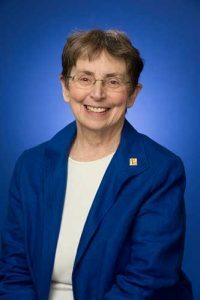 “I am honored to have been elected to this position, and will do my best to help the organization realize its goal of safeguarding and sharing the historical record of congregations of women religious in this country and beyond,” said Sr. Mary Navarre.